What will the Solar Sentinel power? We have found that typical generator lingo is largely meaningless to many of our customers. Most know that a 2,000watt portable generator produces more power than a 1,000watt unit, but if asked to explain what those numbers mean in the real world, they cannot. One of our primary goals in designing the Solar Sentinel was to make it simple and easy to use. In simple terms, a Solar Sentinel is capable of powering anything that will plug into a standard outlet with room to spare. In the US that means 120vAC at 60Hz and 15amps. For example, many portable power units will say they can run a refrigerator, but they have to clarify that they mean a SMALL, bar type unit, and only for a few hours if you are lucky. The Solar Sentinel will power ANY SIZE REFRIGERATOR that plugs into a standard outlet. We could not find a refrigerator sold by any of the big box retailers that the Solar Sentinel would not operate. Just look at the plug. If it will not plug into every other standard outlet in your house, the Solar Sentinel is not the right solution. What won’t the Solar Sentinel power? We do not recommend portable power for running air conditioning or electric heat. While the Solar Sentinel will operate any small AC unit or electric heater with a standard 120vac 15amp plug, it is not sustainable, especially during the evening. Whole house electric heating and AC units, forget it. In fact, portable gasoline generators are not normally suited for this task either. If they are large enough to do this work, you had better have a large fuel storage tank on the property, or hope your power comes back on soon. In an emergency situation, conserve your power and use a small fan if you must. If your wood stove has a blower, that will likely work too. Any appliance with a non-standard plug, and there are too many to mention here, the Solar Sentinel will not power it. You can contact us via our website or social media if you have specific questions on this topic or any others. Our goal is for you to be fully informed before purchasing our product. While the Solar Sentinel is not right for everyone, we strongly believe it is the finest, if not the only portable, sustainable solar generator on the market today. Is the Solar Sentinel easy to setup and use? Absolutely. A key goal in the design, it is impossible to connect any of the Solar Sentinel cabling incorrectly – it will only go one way, the right way. If you are preparing for a storm, roll the Solar Sentinel out of the closet and open it up. If you had stored the Solar Sentinel fully charged, just press the ON switch, flip on the AC OUT circuit breaker and you are in business, no sound, no fuel, no fumes, just power. If you want to top off the battery before the storm, using the heavy-duty extension cord provided with the unit, plug it into a standard wall outlet and the other end into the single round male receptacle on the face of the Solar Sentinel – the only place it can connect. Flip on the AC IN circuit breaker and the Solar Sentinel will come on and charge. The Green Charging LED will light as long as the battery is charging, going off when fully charged. If you stored your Solar Sentinel fully charged, you have the peace of mind knowing that even a year later, it remains near full charge. It is recommended, for maximum battery health, to use and recharge your Solar Sentinel at least once every six months. What do you mean by sustainable power? The big secret in the portable power/solar capable world is just that – they do not generate sustainable solar power. Most don’t call their product a solar generator, because they are really a battery backup, with limited solar charging capabilities. Why does this matter? Let’s say your power goes out at dinner, you plug your refrigerator into the average portable solar power unit and the fridge comes on as advertised. You go to sleep, only to find out, what they didn’t tell you is their smaller storage battery gave out hours ago, and your food is in danger of spoiling. It gets worse. You keep the refrigerator door shut, hoping to recharge the battery in the morning when the sun comes up, before it’s too late. Now, connect their solar panel only to find out it will take days if not weeks to fully charge their battery. If they show it at all, their fine print might show 25, 50, 100 hours or more to fully charge their dead storage battery. This really means 25 solar hours. Sounds ok, right? In sunny Florida, 5-6 solar hours a day is typical. So 25 hours turns into a week and that’s if it’s sunny all week, and you do not try to operate anything while charging. Simply put, unsustainable and not an acceptable performance level at PortaMaxPower. In contrast, the Solar Sentinel was designed to operate your full sized refrigerator, all night, with power to spare in the morning. When the sun comes up, PortaMaxPower’s (3) 330w solar panel array, rated at nearly 1000 watts, will have the battery fully recharged before lunch, while continuing to power the fridge, charge your phone, and so on – now that’s sustainable power. If you wake up to some clouds, the (3) PortaMaxPower panels, made with premium Sunpower solar cells, will still charge your battery for the evening ahead. A simple rule, wake to sunshine, run a coffee pot if you don’t have a camp stove. Run the microwave if you must. Charge your phones, the computer, catch up on the news and you will be fine. If it’s cloudy, even though they are some of the most efficient panels available, the panel’s output will suffer, so be cautious connecting anything that is not imperative. Don’t watch TV, do eat cold food, you get the idea. Of course you can kill the Solar Sentinel battery and have conditions so poor, usually for days, that it is difficult to fully recharge it while in use. While the others don’t stand a chance, with a little common sense, the Solar Sentinel’s state of the art 2400ah LiFePO4 storage battery, and nearly 1000 watts of solar power potential, it is very easy to manage your power usage so that you are able to maintain a sustainable power supply. What do you mean by pure sine wave power? Some electronics require pure sine wave power to operate correctly. The 2.5kva Solar Sentinel provides 2000 watts of continuous, pure sine wave power. Full sized refrigerators, hair dryers, coffee pots, microwave ovens, computers, TV’s, you name it, the Solar Sentinel will power it, with clean, quiet, sustainable power. With a surge capability of over 6000 watts, no worries about starting electric motors either. When we say anything, we mean anything. Can I buy cheaper portable power? If your question relates only to initial cost, yes, absolutely. We don’t dispute that you can go to “brick and mortar” and online stores to purchase a small portable generator much cheaper in initial cost than our Solar Sentinel. Make sure, however, that you buy gas cans, oil, extra spark plugs, and air filters – be sure to fill up the gas cans on the way home and don’t forget the fuel treatment. The Solar Sentinel requires no fuel and little maintenance. Simply use the Solar Sentinel 2400 and fully recharge the battery at least once every six months, that’s it! And with well over 2,000 charging cycles, our LiFePO4 battery does not require replacement under normal use, and our solar panels will continue to charge for more than 25 years. With zero cost to operate, and with modest use of your portable generator, there is no argument that the Solar Sentinel becomes the more cost-effective purchase. Even cheaper portable solar units still require replacement of their storage batteries. Some other portable solar products are just beginning to feature a lithium battery option, but with a different chemistry than ours. Sure, some are lighter and have a solid power to weight ratio and have a lower initial cost, but like the typical units that use lead–acid batteries, if you use it, you will have to replace it. If you own a gasoline generator, you will eventually wear it out and need to replace it. If you don’t use it regularly, you better hope it starts when you need it. Bottom line, do the math, the Solar Sentinel is the most reliable and cost-effective portable generator you will ever buy. Visit our “Solar Sentinel vs. The Competition” page for an easy side-by-side comparison of other popular generators on the market. What can I compare the size and weight of a Solar Sentinel to? While designing the Solar Sentinel, we had to balance size, weight and durability, against what we believe were minimum, acceptable performance levels. We searched worldwide for the finest components to accomplish these goals. The smaller, lighter, more powerful and highly efficient technologies used in the Solar Sentinel are not cheap. It would not be possible to make sustainable solar power in a portable package without it. That said, in some cases, we did not use the lightest components, because they were either unreliable, inefficient, or both. The bottom line, if you can transport a large cooler full of food, drink and ice, you can move the Solar Sentinel without any issues. On hard surfaces, the telescoping handle and in-line wheels on the iM2975 Pelican Storm case make moving easy. If you are loading into your trunk, the rack on your 4-wheeler, your boat, RV, use the soft-grip handles provided and get a helper. Our goal, it had to be rugged and easily transportable – portable power must get to where it’s needed, in one piece, and still work when it gets there. 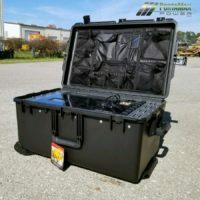 Pelican Case is the industry leader in transporting and protecting valuable gear. The Solar Sentinel is built on an aircraft grade aluminum chassis, permanently shock mounted into an iM2975 Pelican Storm case. This Guaranteed for Life case is the best of the best. When closed for transport (to operate the Solar Sentinel the lid must be open for cooling under most conditions) the case is watertight. Strap it to your 4-wheeler in the pouring rain and head out to camp. When you get to your cabin or tent, bring it inside – the Solar Sentinel is designed to work indoors safely, with no fumes, no sound, just power. On your boat and some weather pops up, shut the lid and ride it out. If the lid is securely shut, the Solar Sentinel actually floats! What makes the battery so special? Our 2400ah LiFePO4 battery is the finest available, offering the qualities we felt were imperative to our design – a super safe track record, high power to weight ratio, over 2,000 charging cycles largely eliminating the need to replace it, and the ability to hold a charge while sitting idle in storage. Most batteries have “memory” issues, often limiting discharge to 80% of the total capacity while decreasing it’s full capacity during the life of the battery, ultimately leading to replacement. Our LiFePO4 battery does not have these requirements. Frankly, were it not for this technology, a portable solar generator of this type would be impossible. To keep your Solar Sentinel battery in tip top shape, we recommend using your SS and recharging at least once every six months. The Solar Sentinel is designed to be used indoors. Only the solar panels need to be outside in the sun. Whether a tent, cabin, boat, RV, even apartments and condos, where gasoline generators are unwelcome. Since there is no sound, no fuel other than the sun, and no dangerous fumes, you can bring the Solar Sentinel inside to where you need it, eliminating the lengthy cords required to move a gasoline generator to a safe and bearable distance. Many lead acid batteries that claim to be sealed, actually are not, releasing corrosive gases as they operate. The LiFePO4 battery used in the Solar Sentinel is completely sealed. While there are dozens of Lithium Ion battery chemistries, some with dubious safety records, Lithium Iron Phosphate batteries have a stellar safety record with more than ten years in the field. The catch, you ask? They aren’t cheap. Setting up the solar panels, is it complicated? The short answer is no, not at all. You can make it as simple or as sophisticated as you like. Again, the cabling is foolproof, only connecting the right way. No worries there. Like all solar panels, the PortaMaxPower solar panels are most effective when correctly aimed at direct sunlight. That’s where the similarity ends. Because the PortaMaxPower solar panels are made from the finest, highly efficient, Sunpower solar cells, and have 10 times the output of the typical 100watt kit, setup can be less critical. Since our panels are light weight, flexible and very durable, with grommets at each corner, using readily available attachments like paracord, bungee cords and tent stakes, you can quickly setup with limited hassle in a variety of environments. We purposefully did not add heavy frames, glass, or clumsy stands to our panels, since nearly every customer has multiple uses, with multiple ideas about the best way to quickly secure their panels. There is no one size fits all solution here, only compromise. If you are tailgating, do you want to set a 25lb metal framed, glass panel on the roof of your SUV? What happens when the wind blows it off, or a kid runs through your cable and pulls it down? Or would you rather place our light, flexible plastic panel up there with a quick bungee to the luggage rack? We offer two solar panel models, both made with industry leading SunPower solar cells, and rated at 330-watts, 57V @ 5.7A each, with grommets. Our folding panel measures 36″x36″ folded in half for transport and weighs under 15lbs. Our flexible panel measures 36″x74″ and weighs under 8lbs. The flexible panel is very flexible, but will not fold in half. Most of our customers prefer the portability of the folding panels. For semi-permanent use like for hunting camps or long stay RV’s, where there is room to transport a larger panel, the flexible panel may be a better solution. The output and cost are the same, the decision is yours. Either way, we highly recommend three (3) panels for true sustainability. Temperature extremes, weather – what should I know? There is no question, all electronics, especially batteries, operate most efficiently and reliably when not exposed to temperature extremes or harsh weather. Since the Solar Sentinel is designed to be used indoors, this is normally not an issue. Electronic equipment, with the exception of a solar panel, should never be stored or operated, in direct sunlight. If you are outside on a hot day, at least get the Solar Sentinel in the shade. In the event the electronics get too hot to safely operate, sensors will shut off the Solar Sentinel until cooling to a safe operating temperature. This is rare, happening under only the most extreme circumstances, and usually while charging with a full (3) panel array. A quick tip here, know that AC output produces very little heat inside the Solar Sentinel and almost never will cause a high temp shutdown. Charging with the recommended (3) panels on a hot, sunny day creates a high current and a good deal more heat. If the unit shuts off due to heat, try disconnecting a panel, maybe two, since charging slower in extreme heat is better than not charging at all. A tarp and some paracord will keep both of you out of the weather in most cases. Freezing temperatures are potentially the worst scenario for most batteries. The LiFePO4 battery in the Solar Sentinel has one of the widest temperature operating ranges of any battery type. See the owner’s manual for exact specifications. That said, freezing temperatures will cause extreme loss of efficiency. So keep the Solar Sentinel inside with you, where it’s warm, at least above freezing. Another tip: Using the Solar Sentinel in cold environments will generate some heat. Letting the lid rest on the cabling will keep some of this heat inside. Do not do this in a hot environment. Finally, if you are transporting the Solar Sentinel with the lid latched shut, rain is not an issue. When operating, keep it out of the rain, as cooling vents can allow water inside the unit causing permanent damage that may not be covered by warranty. Please see the owner’s manual for a more detailed description. Why are there no USB or cigarette lighter plugs? We purposefully left them off for several reasons. Simplicity for one. Reliability as well. Cost was not a consideration since adding them is very inexpensive. USB plugs can draw power even when not in use. It’s a small amount, but in an emergency, every little bit helps. In most conditions, with most electronics, they are charged or operated most efficiently using the power supply/charger supplied by the manufacturer. Using aftermarket chargers take longer and can affect long term battery health. Finally, whatever you need to bring along to power your gear will easily fit in the Solar Sentinels lid organizer. Keep an extra in there for an emergency. Heck, if you must have a USB cube or 12v plugin, keep one in the organizer too. They are very cheap and easily replaceable. Is it fully charged when it arrives? It is not. Before you store it — play with it, use it, charge it, either by the grid or solar panel. See the owner’s manual for simple instructions. How is the Solar Sentinel shipped? PortaMaxPower uses freight shippers to transport the Solar Sentinel 2400 and the Solar Sentinel Power Package. We understand that this is a large, heavy package, and you may or may not have help when it arrives, so for the Solar Sentinel Power Package Deal we offer free White Glove shipping. Our White Glove shippers will call to set up a delivery time window once the unit has arrived in your city. They will bring it into your house for you, to the room of your choice. There are limitations with remote areas, walk ups, and the like. Visit our Shipping Policy page for more information. All other products and accessories ship via standard ground shipping at our sole discretion. PortaMaxPower has a no hassle, 30-day money back guarantee if you are not fully satisfied with your purchase. Click here to read our full Return Policy and process. Click here to visit our Warranty Registration page. Where can I find an owner’s manual? Using your smart phone scanner, you can scan the QR code next to the Solar Sentinel label located inside the case. You will be automatically directed to our website where you can click on the Owner’s Manual link. If you ever have questions that you cannot find an answer, please Contact Us.